Some modules have the capability to process files. These modules can either return an output file to be sent for further processing or require a file to be passed to them for processing. For these modules to work together to process files they have to be mapped to eachother. When you map a file, you choose from which module(s) in your scenario you want to obtain the data from. The file name and file content are then automatically mapped as they are. 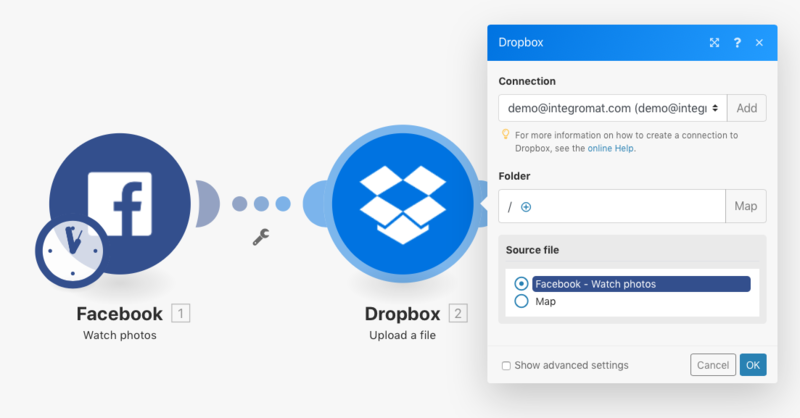 The example below shows how to map photos (files) from Facebook to Dropbox. The Facebook trigger Watch photos returns detailed information about each downloaded photo, including its name and content (data). 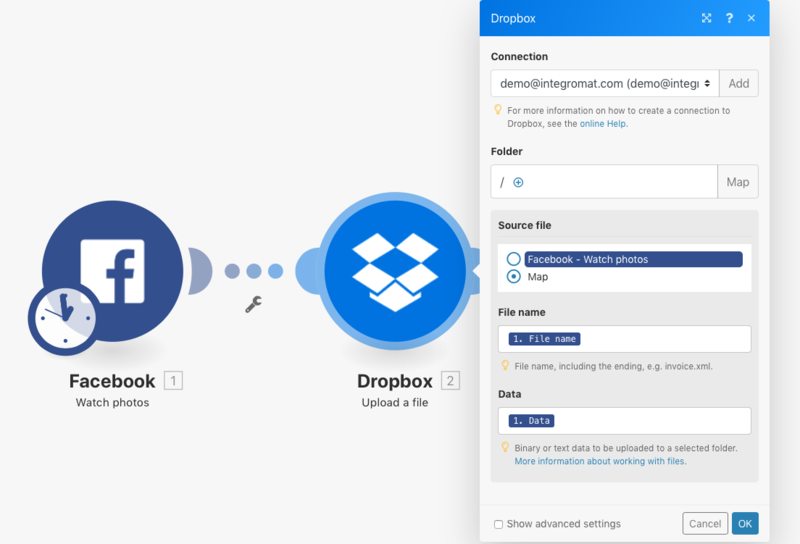 To map this information to Dropbox so it can be uploaded, the Dropbox action Upload a file requires you to specify the source file that this information will be mapped from. By selecting the Facebook - Watch photos option under the source file, Integromat will automatically map the file name and file content. From now on, all photos from Facebook will be uploaded to the specified Dropbox folder. However, it can happen that you want to rename the file, but want to keep the data as it is. In such case, use the Map option (as seen in the image below) to map the file name and file content independently of each other. You will have to enter the full file name, including the ending (e.g. invoice.xml). Both binary (photos, videos, PDF and the like) and text formats are supported. The maximum file size is 50 MB. If it is exceeded, Integromat proceeds in accordance with the settings of the Enable data loss option.